Rocky Top Sports World is thrilled to announce a new, exciting feature for residents, athletes, and guests! 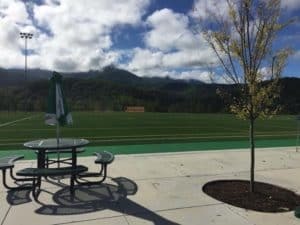 The City of Gatlinburg recently completed construction on a greenway around our Smoky Mountain sports complex and Mills Park. The new greenway provides a convenient and scenic way to travel from field to field. Read on for everything you need to know about these beautiful walking trails. The new greenway is the result of a partnership between Rocky Top Sports World and the City of Gatlinburg Recreation Department. Rocky Top provided the signs for the greenway and the City Parks and Recreation staff were in charge of construction. As usual, working with the City has been an absolute pleasure. The Mayor of Gatlinburg, Mike Werner, is as excited about the project as we are, telling the press, “Since the planning phase of the sports complex, the City and Rocky Top staff have envisioned a walking trail to tie all the fields together. That vision has now become a reality”. While the greenway will benefit teams visiting Rocky Top Sports World, it is also for the enjoyment of the public. We invite anyone and everyone to walk the greenway to get some exercise and to see everything going on at our Smoky Mountain sports complex. The only restriction on public access to the greenway is from 8 a.m. – 3:30 p.m. when school is in session, during which time the Green Trail will be closed to pedestrians. Parking for the greenway is available at Rocky Top Sports World, located off East Parkway at 1870 Sports World Boulevard. The greenway consists of two different trails, marked by green and orange arrows. The Orange Route begins at Field One next to The Rock, our indoor sports facility. The Rock is home to six hardwood basketball courts, 12 volleyball courts, three team rooms, bleacher seating, and more. At four tenths of a mile, the Orange Route is a short paved loop around the Rocky Top Parking Lot. The Green Trail also begins at Field One. Consisting of gravel paths, paved walkways, and a staircase, this trail is eight tenths of a mile long. Walkers can use this trail to travel to Field Two, Field Three, Hammonds Field at Gatlinburg-Pittman High School, and finally Mills Park. A popular destination for locals and visitors alike, Mills Park offers a playground, disc golf course, track, basketball courts, covered picnic area, and charcoal grills. After reaching Mills Park, the Green Trail loops back around to the Gatlinburg-Pittman baseball field and continues back to Rocky Top Sports World. Rocky Top Sports World is an 80 acre Smoky Mountain sports complex with everything you need to host an unforgettable tournament or event. With seven outdoor fields, a massive indoor facility, an onsite restaurant, and so much more, it’s easy to see why we’re one of the top sports destinations in the Southeast. Check out the Rocky Top Sports World Facilities page to learn about everything we have to offer! This entry was posted in Our Gatlinburg Sports Complex on January 31, 2016 by Jason Fishman.